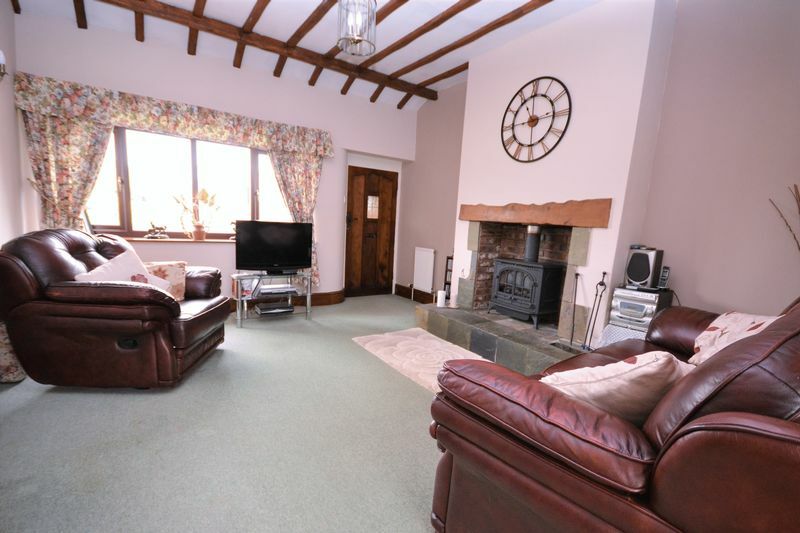 Standing in approximately three quarters of an acre, this spacious, detached, three-bedroom true bungalow has more to offer than meets the eye for a discerning purchaser. 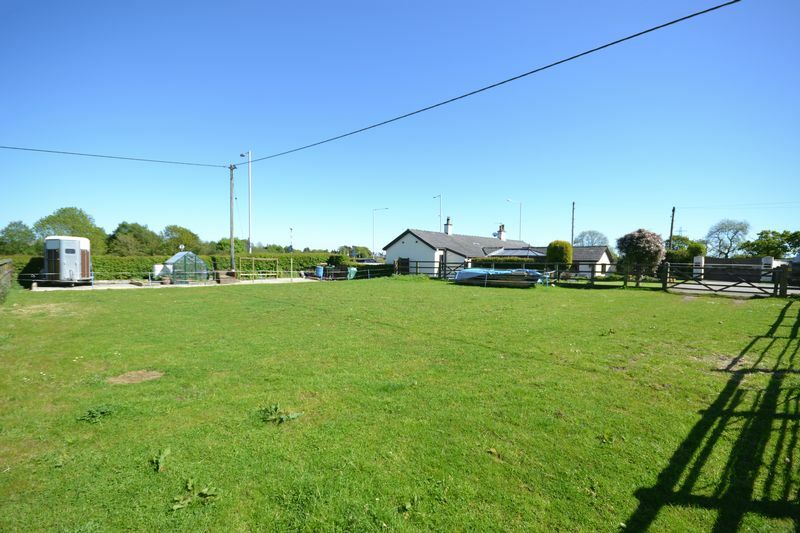 Planning consent has been granted for a further bungalow alongside; on land currently equestrian themed having an adjoining paddock, parking and turning areas. 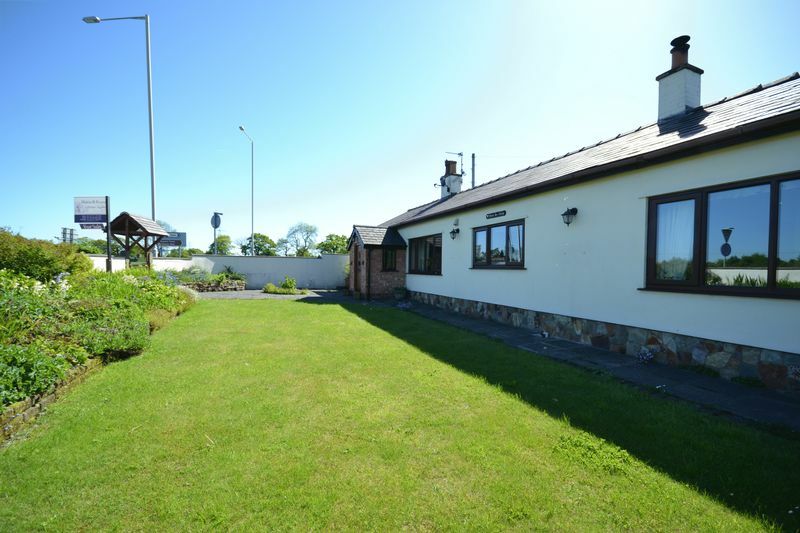 The bungalow is approached via timber double gates which open to a concrete parking and turning apron for several vehicles. A York stone and cobbled pathway with steps lead up to a sheltered, sun-trap patio to the rear door of the property, also the mostly-used entrance, and the description will start here. 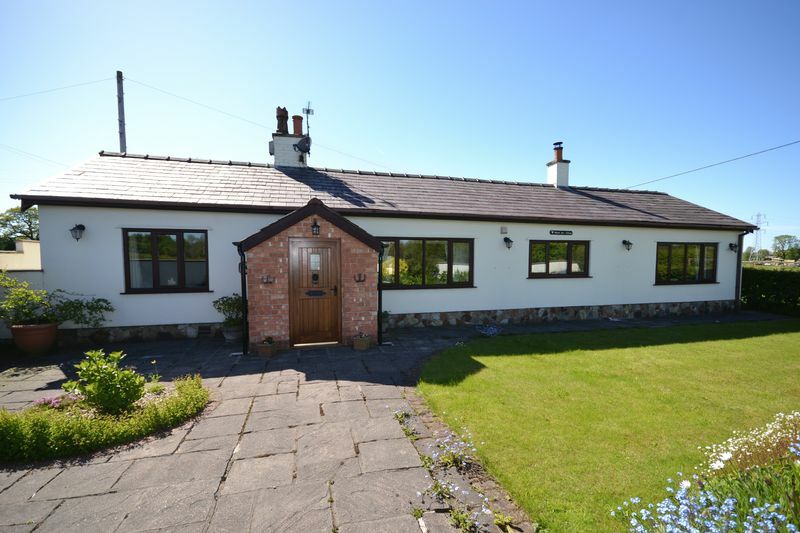 Double doors open to the good-sized uPVC conservatory with ceramic tile flooring, pendant light and a central heating radiator. Sliding double doors open from here to the broad hallway which runs across the property and gives access to the accommodation. 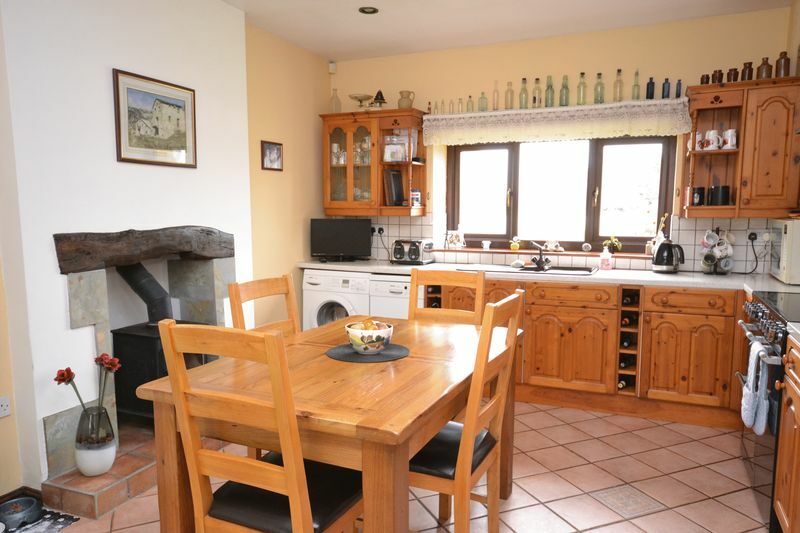 Exposed rafters and beams line the tall ceiling and, directly ahead, is the dining kitchen with ceramic tiled floor and central space for a table and chairs alongside the stone edged ingle and hearth housing a log burning stove with beam above. 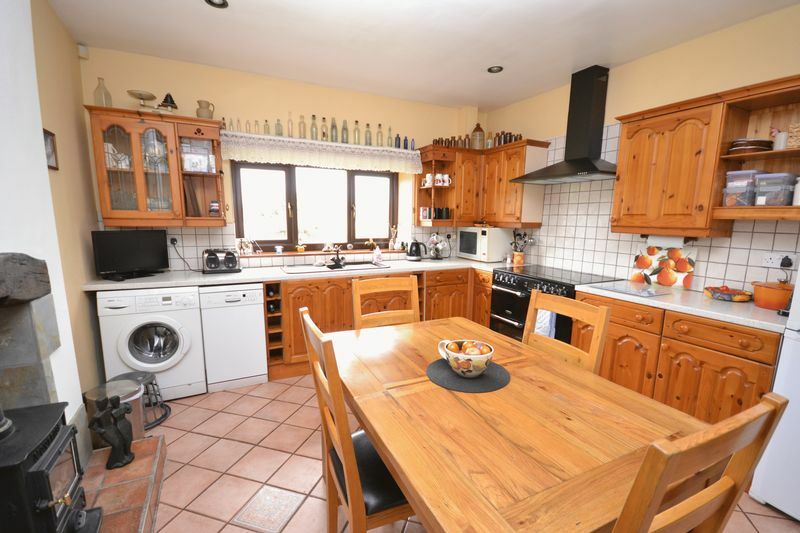 Two walls are fitted with a good range of pine wall and base units having splash tiling between and including drawers, shelves, glazed display cabinets and a wine rack. The coordinating Formica work surfaces incorporate a one and a half bowl coloured sink unit with mixer tap over which is set beneath the window to the front. Cooking facilities are provided by the electric Leisure Cookmaster range-style oven with five-ring ceramic hob. There is plumbing for an automatic washing machine and dishwasher, space for a larder-style fridge freezer and inset spotlights illuminate. 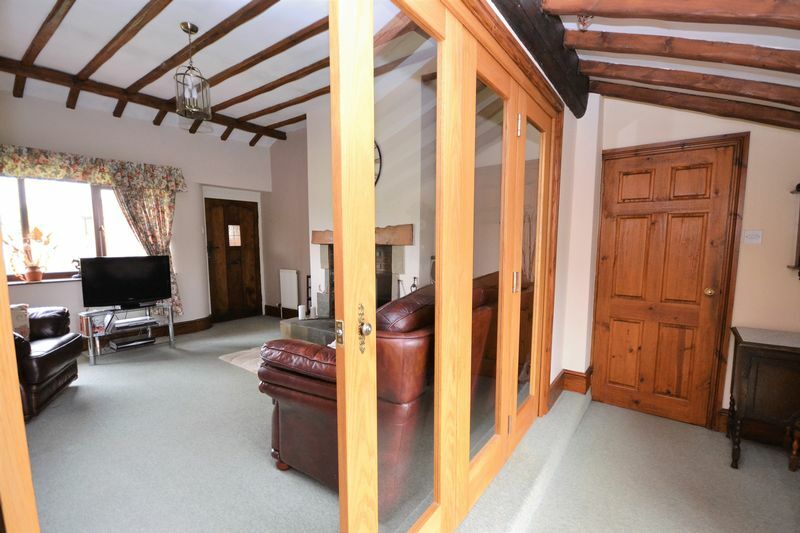 Bi-folding doors from the hall give way to the comfortably spacious lounge with a picture window to the front offering far reaching rural views. A gas coals stove rests on a raised slate tiled hearth set into a brick ingle with beam above and having a television point alongside. Pendant and wall lighting provide an evening ambience and highlight the exposed rafters to the semi-vaulted ceiling. An oak door with glazed insert opens to the front quarry tiled porch with a side cupboard housing the Worcester gas central heating boiler. A further matching door leads to the front garden, this being the original main door. 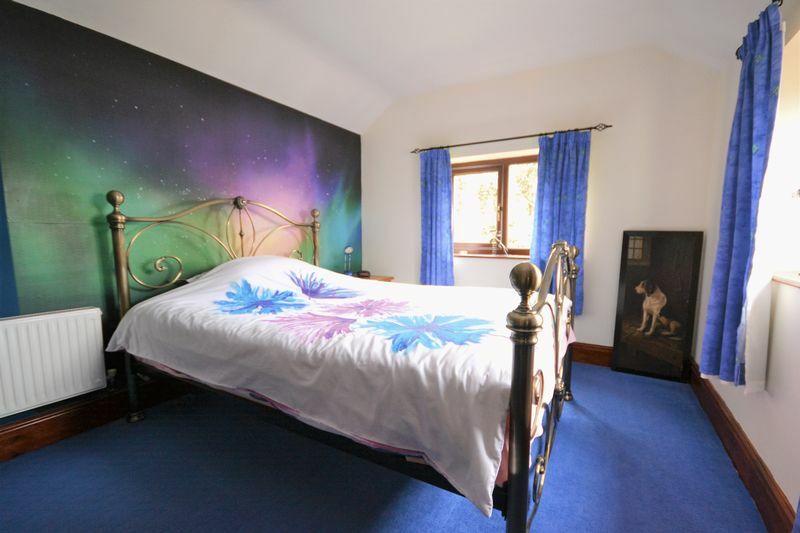 The master bedroom has a picture window to the front, also enjoying rural views and, to one wall, a range of wardrobes with sliding doors – one of them mirrored. Pendant and over-bed wall lights illuminate. 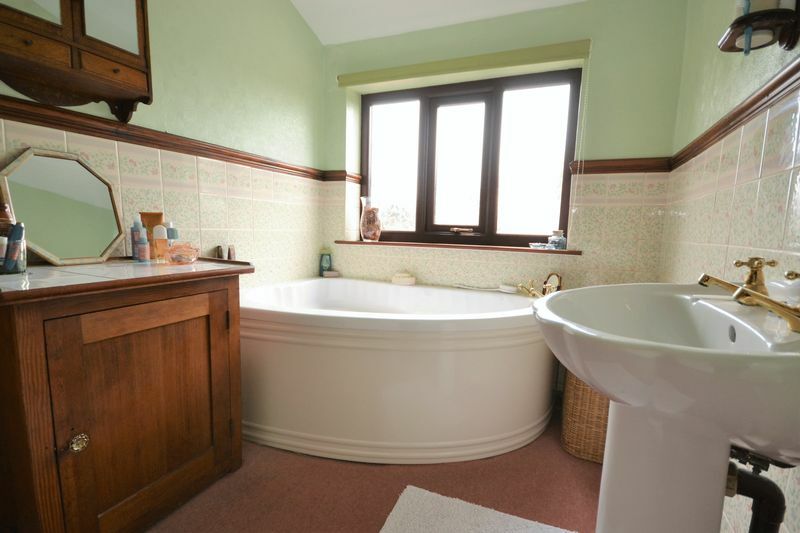 The en suite bathroom has two opaque windows to the rear, two pendant lights, tiling to dado height and a three-piece white suite comprising corner bath with seat, pedestal wash hand basin and low flush w.c.
A further door from the hallway leads to an inner vestibule with a door to the rear garden, pendant light and access to bedrooms two and three plus the shower room. 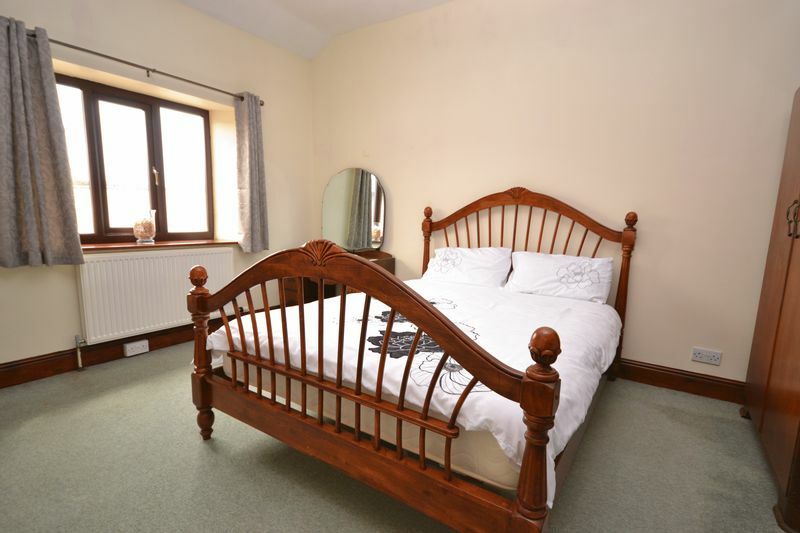 Bedroom two with a double-glazed window to the front, has a semi vaulted ceiling which enhances this already spacious room and which also benefits from fitted cupboards and a loft access point. 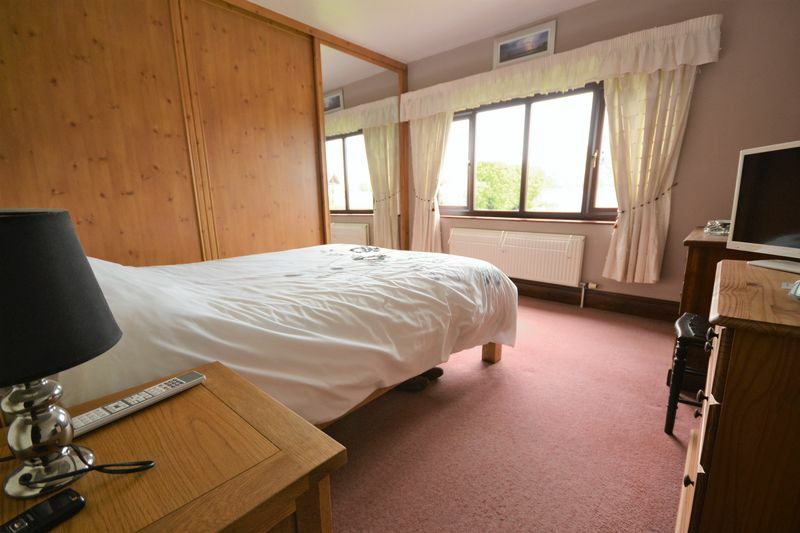 Bedroom three is dual aspect with windows to the side and rear and ample space for wardrobes etc. 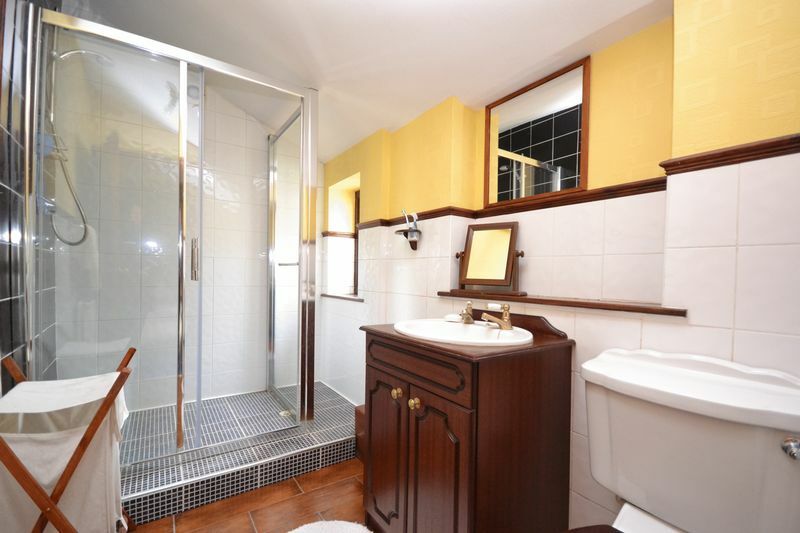 These two rooms are served by the mostly tiled shower room with an opaque window to the side, ceramic tiled flooring and a three-piece white suite comprising a one and a half sized glazed cubicle, vanity set wash hand basin and low flush w.c. plus a radiator to warm the towels. Accessed via a pretty lich gate, the front garden has a flagged path to the door and is mainly laid to lawn with charming raised borders of mindfully chosen herbaceous planting and spring bulbs to offer year-round displays of colour. A gate gives way to the second hard-standing area which plays host to the greenhouse and which abuts the stock fenced paddock and sand paddock beyond. A timber five-barred gate opens to the yard and the three block-built stables with power, light and water supply. 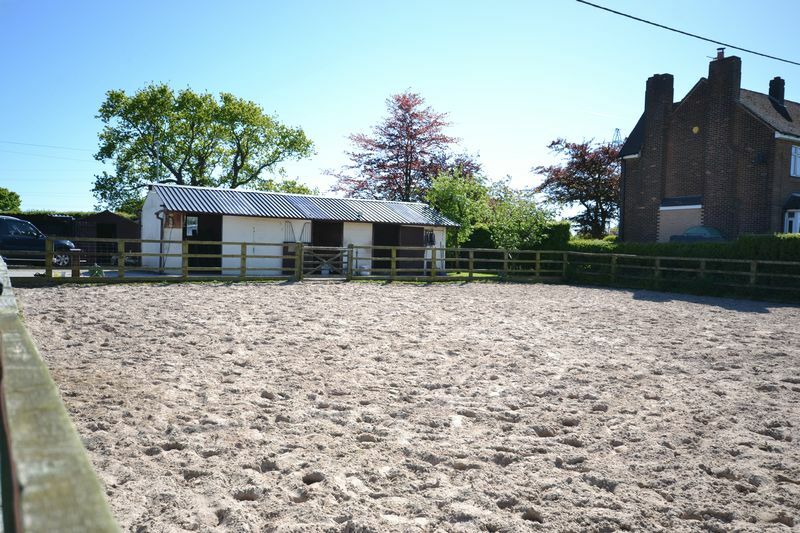 Behind this block sits a further block-built former stable with tack cupboard plus a range of three timber storage sheds and feed store. 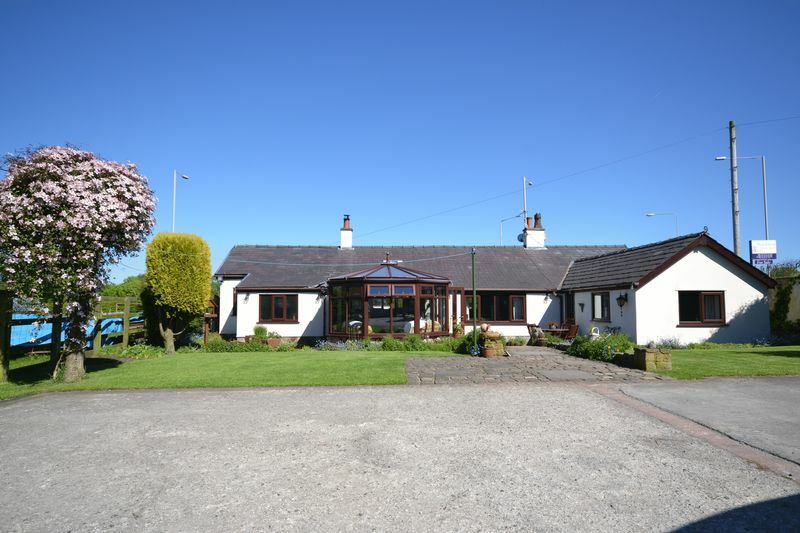 The site of the above mentioned stable blocks and sheds forms the location on which planning consent has been granted for a detached two-bedroom true bungalow of just under seventy square metres and which will be accessed via Mill Lane, Charnock Richard. 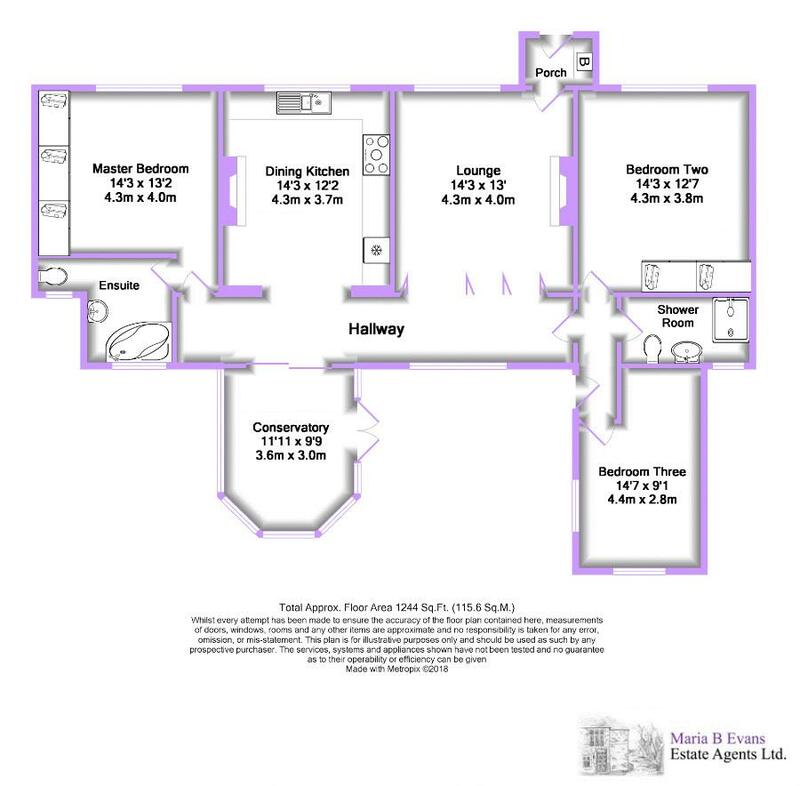 Plans can be viewed on the Chorley Borough Council Planning Website under Application 17/00683/FUL and Building Regulation Approval Notice 17/00750/BR detailing the conditions of the build. Alternatively, please contact us for further information.